In inaugural Dean's Distinguished Lecture, Ray Mabus urges aspiring lawyers to "plant a thousand trees"
US Secretary of the Navy and former Mississippi Governor Ray Mabus presented the inaugural talk in the Dean’s Distinguished Lecture Series September 20, giving the BC Law community insight into his career in public service before fielding a range of questions from climate change to the Navy’s crucial role backing US policy in the Middle East. 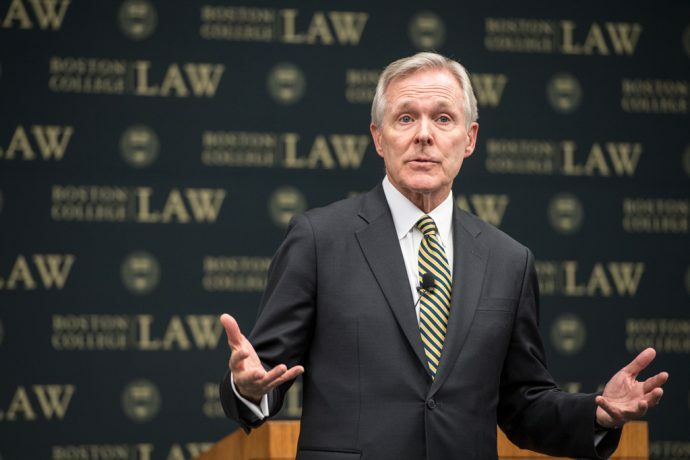 Mabus, a Harvard Law graduate and the longest tenured Navy Secretary since World War I, first outlined his initiatives to modernize the Navy’s operations and, in particular, to catch its personnel strategy up to the needs of the 21st century. 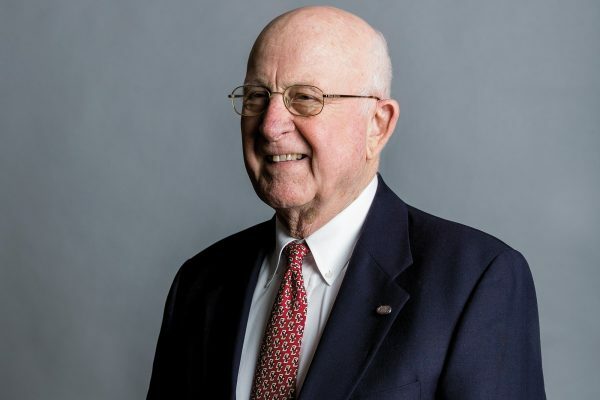 Among other fiscal and technical accomplishments, the Mississippi native noted expanding the fleet, optimizing maintenance expenditures, increasing the use of renewable power sources, and strengthening the Acquisition Integrity Office. That office now reviews more than 1,100 cases annually, some 10 times the number before he was appointed in 2008, by using a newly developed set of accounting “trip wires” designed to snuff out corruption. The Secretary was equally proud, though, of his work pursuing equality of access, improving quality of life for the Navy’s personnel, and getting the word out about the greatness of the armed forces’ work in the world. Part of this, Secretary Mabus said, is ceremonial—for example, he’s set a naming convention for a newly ordered class of ships around modern civil rights leaders. But it’s also about making life in the Navy more closely reflect new social norms, from ending Don’t Ask, Don’t Tell and gender-specific uniforms to bringing women into combat roles, and smaller improvements like expanded childcare offerings on bases and more flexible leave programs. Reflecting on a career in politics that began in the Mississippi state auditor’s office, the Secretary argued that legal education ought to reflect a personal pursuit of justice, by acquiring the skills needed to achieve what the country, and the world, need—including an understanding of the challenges involved. Several of these were articulated during the Q&A session, when the Secretary assessed the effects of climate change on naval operations, recent news of misconduct among high-level officials in the military (“We always announce it as a matter of policy,” he said of the Navy), working with today’s Congress, and the value of seaborne remote strike capability in coping with the conflicts in Syria and Iraq. Story by Tim Bourgaize Murray ’19.